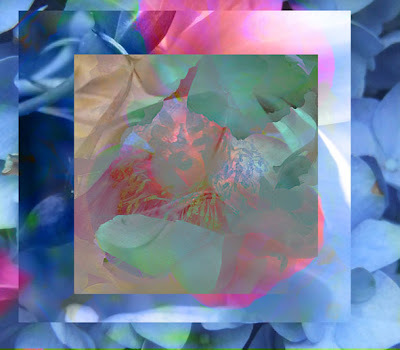 I've been playing around with the recent flower photos and these are 3 of the results. I'd like to do some canvasses based on the first two I think. Maybe using acrylic inks to get the luminosity??? I quite like the geometric hard edges playing against the flowing natural forms of the petals and stamens. 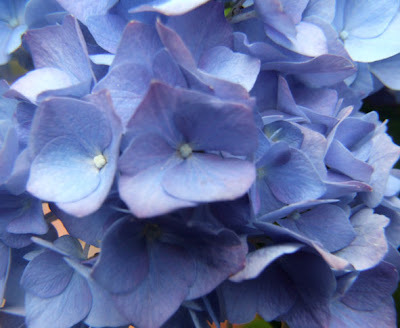 Aren't hydrangeas just the most beautiful blue? The light was lovely in the garden so I went out with my 10x magnification filter to get close ups of some of the flowers. Rather than another update on the seascapes I've decided to run another challenge in response to feedback from the trees post. 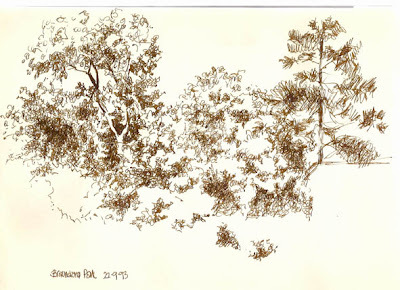 The challenge is to produce sketches of trees done from life. The last one I showed, of the harbour, has had the lower section of sky lightened and I think is finished. Botallack mine is moving onwards but large areas are still just blocked in. 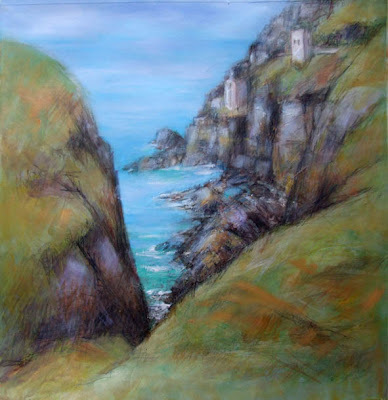 The foreground has a long way to go and the far cliffs and mine houses but the sea and sky are further forward. The sea is going to be wilder, crashing onto the rocks and cliffs. I worked a little more on the 10 inch canvas today - the photograph annoyingly doesn't bring out the viridians enough. I'll try again tomorrow. Adjusting in photoshop alters too much and has tipped it towards turquoise too much but I thought I'd show that I am working! I will lighten the bottom of the sky a little when this paint is dry. 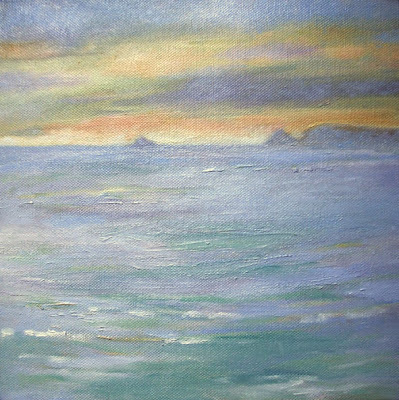 I started another 10 inch canvas with an underpainting - it's from a sketch of a subtle pearly dawn -all soft peachy colours in the sky with mauves and pale jades and soft grey blues in the sea, all very pale. 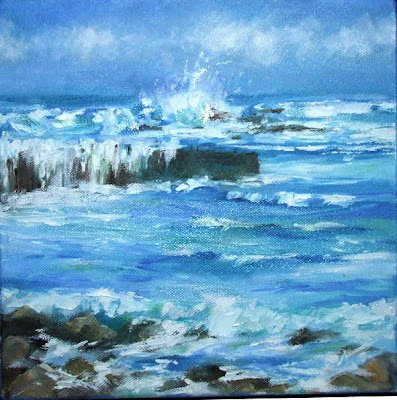 I think I may do a series of these little 10 inch canvasses as they work well together. I also worked on the 16x20 canvas below. It's just at the blocking in stage as yet and it all needs finishing and pulling together. I took another look at that painting I wasn't happy with, bearing in mind crit from friends on and off line and my own feelings about what was wrong. I spent about 10 minutes on it with oil paint scumbled over in areas, allowing the acrylic underpainting to shine through and leaving a lot untouched. This is an old sketch done in a local park. I was trying to describe the different types of trees and their distinctive shapes, character and foliage with just pen lines. Looking back at it I like the positive/negative changes with light trunks against shadowed foliage and dark trunks against light, changing back and forth. That poor Rotring pen hasn't been used in a long time, maybe I should dig it out. I really prefer less scratchy media. I like trees - not quite as much as water but nearly! Trees can have very distinct character, rather like people and I really dislike the generic woolly trees in some 'how to' books. 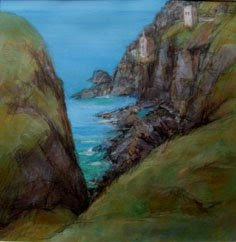 This is a another view of the tin mines that cling to the base of the high cliffs at Botallack. I'd decided to use acrylics to see how I liked working with them in comparison to the oil sketches I'd done. :>( I missed my oils. I ended up throwing some coloured pencil into it to pull it together - but I still prefer my oil paintings. It probably needs a bit more doing to it. What do you think? honest c&c please? 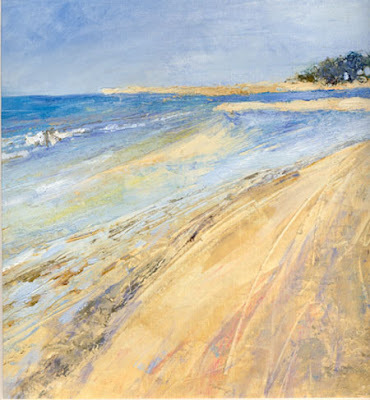 What to take when you go sketching plein air? what materials? what equipment? what medium? - oils? watercolour? pastel? acrylic? coloured pencil? pencil? what size paper/canvas/sketchbook? what to sit on? what and why? that's like 'how long is a piece of string' - one person's perfect kit isn't going to be right for another. All I can say is what is right for me. If with family then what I take is lightweight and limited, and may be simply a moleskine or other sketch book and a mechanical pencil or biro.